Have you ever found yourself stuck inside on a rainy day with bored children? It seems to me that whenever it’s rainy and we’re stuck in the house, they run out of things to do in record time. Sound familiar? I’m always on the hunt for new & creative ideas to keep them occupied while we are in the house for long periods of time. My boys are BIG Play-Doh fans, it seems that once the colors mix together, they lose interest in it – and anyone that’s ever played with Play-Doh knows that it happens in no time. It gets costly to keep having to buy new tubs of Play-Doh, but a while back I found out about a recipe for “slime” that my boys absolutely love and it’s incredibly easy to make. And the best part is that you can keep the colors separate! This “slime” lasts for several months if kept in an air-tight container! In my house, this stuff is good for several hours of entertainment, so I really wanted to share it with everyone. Mix half a cup of Borax with two cups of water in a container with a lid. Shake thoroughly. Mix a cup of glue with a cup of water in a bowl, and stir well. Shake the Borax mixture thoroughly and put 3 tablespoons of it in a second bowl. Add 3/8 cup of the glue mixture and a few drops of food coloring. Stir, and the mixture will turn into a semi-liquid putty. Your slime can last for weeks in a covered container. **I’ve tried this recipe with store brand glue & it doesn’t hold together as well as Elmer’s glue, so I suggest sticking with Elmer’s for this! If you try it out, leave a comment and let me know how you liked it. Have fun! Thanks Robin this sounds lots of fun! Fun! We’ll try that soon. 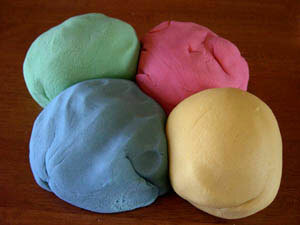 My kids also love playdoh but most of it is now a yucky grey!